P. BOUCHET. From specimens to data, and from seashells to molluscs: The Panglao Marine Biodiversity Project. With a goal to measure levels of species richness in complex tropical coastal environments, the Panglao Marine Biodiversity Project has targeted a 15,000 hectares site in the Central Philippines comprising a mosaic of habitats between 0 and 150 meters deep. The project deployed a manpower of about 2,000 day-persons in the field to conduct bulk sampling of residues and targeted collecting in specific habitats. Compared to a New Caledonia site that had been sampled with the same approach, the Philippines site is 40% to 50% richer in species, and the Panglao site is estimated to have somewhere between 4,000 and 14,000 species of molluscs. 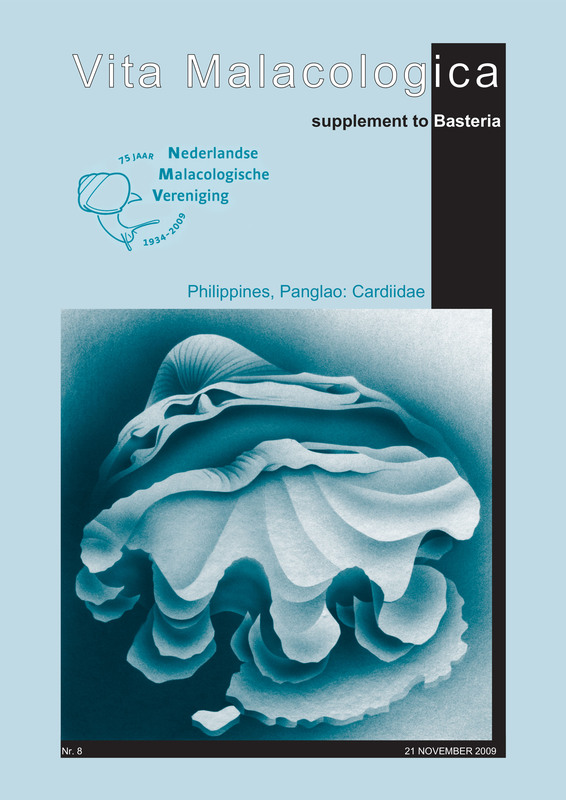 The taxonomic study of collectable seashells families (Terebridae, Muricidae, Conidae) shows no new species or even new records, suggesting that in 30 years of commercial collecting in the Central Philippines the local diversity in that size class has by now been adequately sampled. By contrast, an analysis of the Pyramidellidae reveals unsuspected levels of diversity: 715 species of Pyramidellidae were effectively sampled in Panglao, and biodiversity estimators suggest that the real number at the site is in the order of 841 – 1,132 species. Most of these species are rare (29% are represented by singletons) and most are small (41% have adult sizes equal or below 2 mm). The effective identification, description and naming of species in the species-rich families – Turridae, Pyramidellidae, Eulimidae, Cerithiopsidae, Triphoridae, Galeommatidae – is a challenge to taxonomists. J.J. TER POORTEN. The Cardiidae of the Panglao Marine Biodiversity Project 2004 and the Panglao 2005 Deep-Sea Cruise with descriptions of four new species (Bivalvia). Sixty-three Cardiidae species (including Tridacninae) sampled by the 2004 Panglao Marine Biodiversity Project (PMBP) to Panglao, Philippines, and the PANGLAO 2005 Deep-Sea Cruise are described. In addition, Cardiidae species lists of the Philippine Cuming Tour 2005 and AURORA 2007 expedition are provided. Four species are new to science: Fragum grasi spec. nov., Frigidocardium helios spec. nov., F. sancticaroli spec. nov. and Microcardium velatum spec. nov. For the following six species this paper includes the first published records for the Philippines: Acrosterigma dianthinum (Melvill & Standen, 1899), F. torresi (E.A. Smith, 1885), Fulvia (Laevifulvia) subquadrata Vidal & Kirkendale, 2007, Microfragum erugatum (Tate, 1889), M. subfestivum (Vidal & Kirkendale, 2007) and Vasticardium sewelli (Prashad, 1932). Indo-Pacific range extensions for several other species are given. Ecological data support assignment of Afrocardium to Orthocardiinae. Cardium (Ctenocardia) victor Angas, 1872 and Cardium bomasense Martin, 1917 are transferred to Freneixicardia, the former being the sole extant representative of the genus, and of which Cardium (Trachycardium) hulshofi Pannekoek, 1936 is a new synonym. Based on shell morphology, it is shown that the current variously adopted generic assignments of Cardium lobulatum Deshayes, 1855, C. attenuatum G.B. Sowerby 2nd, 1841, C. biradiatum Bruguière, 1789 and C. multipunctatum G.B. Sowerby 1st in Broderip & Sowerby 2 nd, 1833 are unsatisfactory. As a consequence, the alleged Indo-Pacific presence of the genus Laevicardium is questionable. Fulvia (Laevifulvia) imperfecta Vidal & Kirkendale, 2007 is a new synonym of “Laevicardium” lobulatum Deshayes, 1855. Habitat preferences of the taxa encountered during PMBP 2004 are defined, based on four main macro-habitat categories. SEM photos, showing the early ontogenetic stages, demonstrate markedly allomorphic growth of some taxa. Description of the process of development to the terminal shell shape provides a more complete species concept and rigorous species delimitation.